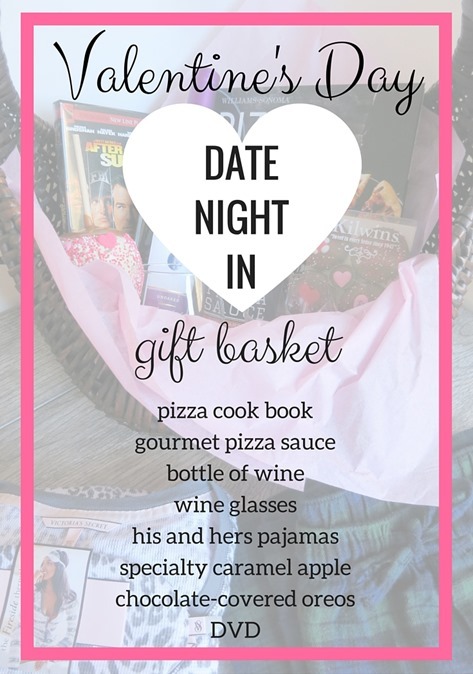 A Date Night In Gift Basket is a budget-friendly Valentine’s Day gift idea perfect for the couple who prefers to keep things low key and extra cozy on February 14! 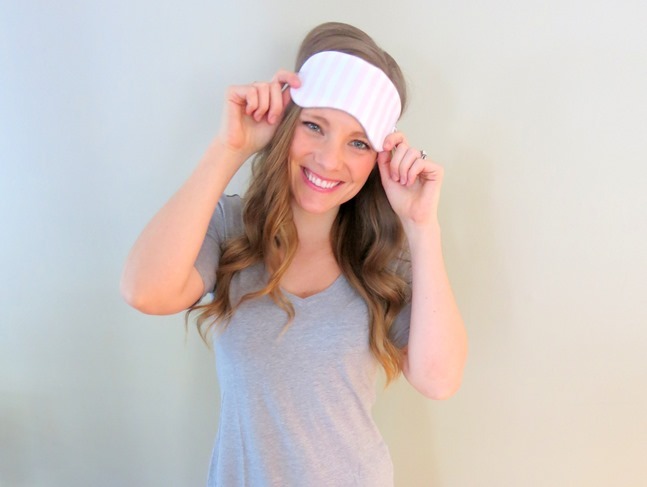 Thank you to Victoria’s Secret for the adorable pajamas featured in this post! When it comes to Valentine’s Day, Ryan and I like to keep things pretty low key. We’re all about budget-friendly romantic gestures and tend to shy away from super fancy dinners and overpriced gifts on February 14. You guys know by now how much I love assembling a good gift basket. I’ve previously shared gift basket ideas to celebrate everything from a bachelorette party to a couples’ engagement and this year I figured I’d turn my gift basket love toward Valentine’s Day! As new parents, Ryan and I don’t really have the desire to try to find a babysitter on Valentine’s Day. For those of you who might be in a similar boat, a cozy night at home might sound awfully appealing, but why not kick things up a notch and make a night in together a little more special with a Date Night In gift basket? Assembling this Date Night In gift basket was a lot of fun! I wanted to be sure to include essentials for a delicious dinner (helloooo pizza!) and some sweet treats for dessert, but I also made sure to throw in a bottle of wine, a movie and some cozy new pajamas! For this particular gift basket, I included his and hers pajamas. Victoria’s Secret reached out to me to share a little bit about their cute Valentine’s Day pajama sets and I couldn’t resist including a pair of them in the gift basket along with a comfy pair of flannel pajama pants for Ryan. I picked out two pairs of Valentine’s Day cozies and selected The Mayfair Teejama, a classic tee and lightweight pajama bottom set, and a pair of cheetah-print thermal pjs. (These do not appear to be online, but I found them in-store last weekend.) Both came with matching eye masks that I thought were way too cute! I’ve been wearing Victoria’s Secret pajamas for years, so I had no doubt these would be just as soft and comfortable as my previous pairs. Just in case you want to snag a cute pair of their pjs (or something a little sassier!) for yourself, Victoria’s Secret is offering $15 Off $100, $25 Off $150 and $50 off $250 with the code SPRING2016. The gift basket is easy to customize for your loved one! Throw in their favorite bottle of their favorite wine or a bag of their favorite candy. Add in a new album from their favorite band. Include a bottle of lotion with the promise of a massage. What have been some of your past favorite Valentine’s Day gifts to give or receive? What would you include in a Date Night In gift basket? What a cute idea! My husband and I are also low key on Valentine’s Day. We have had many date nights in while our one year old daughter sleeps. This would be a fun gift. I love the PJs from Victoria Secret! I have those cheetah print jammies from VS too! (along w/ about 5 other similar pairs – obvi I’m a big fan) My hubby loves them on me, & they’re soooo comfy. They keep me toasty warm without being too hot to sleep in, & they’re true to size. LOVE VS jammies! I love this idea! I’m all about low-key Valentines Day. I just realized, however, that my husband and I have been together (mostly in a dating relationship) for seven years and have only spent one Valentine’s Day together, due to living in different cities or one of us traveling for work. It was last year and we spent the entire day driving through a blizzard to our new home in a different state. It was super memorable but I’d rather get cozy with pizza and a movie this year! i’m 100% obsessed with all the victoria’s secret pajamas i’ve purchased in the past. they are always so comfy and cute! 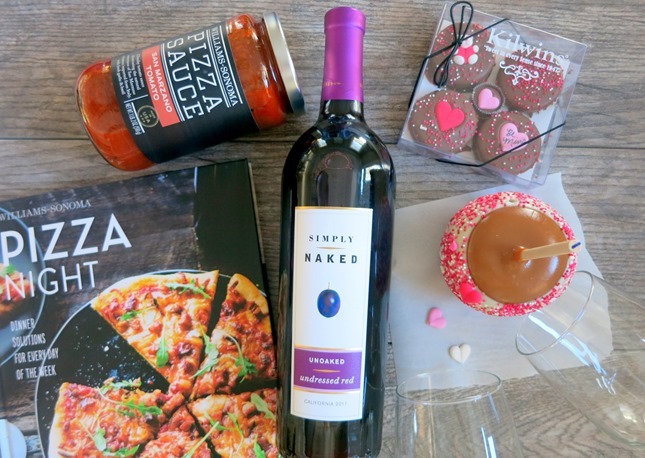 and i love this idea, i’m currently trying to figure out what to get my boyfriend for valentine’s day, and a night in with pizza and wine sounds right up our alley! I love Victoria’s Secret cozies! I have four pairs of the boyfriend lounge pant. LOVE! For Valentine’s Day, my husband and I always give each other experiences. This year we are planning on packing a dinner, bottle of champagne, and snowshoeing up one of our local mountains to watch the sunset. Then, we will hike back down with headlamps and the moonlight! I can’t wait for our little adventure!! I love those pajamas! I currently have a pair from American Eagle which are flannel and super warm but these are super cute and look super comfy! We are definitely morning people! I would love to include a bag of coffee and some things to make a delicious breakfast! So cute! I’m also obsessed with gift baskets and themed gifts–perfect! Love this!! I did a gift basket last Valentine’s Day and I’ll probably do another one this year haha! I love those pajamas!! Super cute. My husband and I exchange PJs every Christmas Eve and he always gets me a pair from Victorias Secret. i think your hubby needs to model some men’s pj’s, ha! i have yet to celebrate valentines with the current beau. we’re always working in different cities and this year i’ll be in a different country! maybe we’ll have a night in when he comes to visit. Such a cute idea. My husband and I don’t have any kids yet, but life is always so busy we love a good night in. I love the idea of including PJ’s in a V day gift basket. I thought of buying my husband and I PJ’s for valentines day because he always makes fun of the fact that I still wear old college/high school t shirts and soffe shorts to bed, lol. And I love your bed! Love the basket ideas- so cute! We have two little kiddos so the chances of us headin out for the night is slim haha. Btw, VS Jammie’s are the best! Super cute PJs! I’d say gummies and caramel popcorn would be must haves for our gift basket! Would love to read a blog post on your decoration style. Really enjoyed your office tour and your coloring in the bedroom looks like mine! 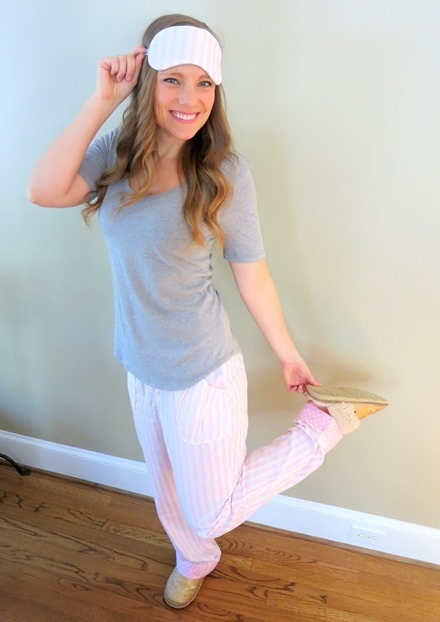 Cute ideas and cute pjs! I’m not sure I’m creative enough to put together a gift basket but my husband and I are ordering a Blue Apron meal for Valentine’s Day and plan to cook and have a relaxing night at home. So many amazing products to choose from but I would definitely have to go with cleaning products for the house. My sin and I are so sensitive to the nasty chemicals in the products my boyfriend always buys. Would love to stock up! One thing? OMGosh I’ve already got a cart full! Bars, stevia, oat flour…and I’ve not finished browsing! I’ve recently had a bad experience with online ordering from a site similar but since I read it here, I will definitely give it a try! Great post!! Awesome Valentines idea! I would def love to stock up on some cleaning supplies! I have yet to try any of their cleaning supplies but have heard great things from people who have used it! Such a cute idea! And those PJs looks SO COZY right about now on this Wednesday morning, haha. Your Valentine’s date night in is my Valentine’s Day celebration each year, haha. I am single (and have been for a loooooong time) and I usually just buy wine or champagne for myself, chocolate for myself, make dinner for myself, and climb into pj’s with a movie. I think I may treat myself to a new movie on my Amazon wish list. Totally unrelated, but I LOVE your headboard! Your bedroom looks so cozy! Hi Julie! The gift basket idea is so cute. I also absolutely LOVE your headboard and have been looking for one like that for a while – could you possibly let me know where to find it, please? Thanks so much!